What are some of the peoples and towns once lost to history that now discovered substantiate the Bible's account? Nathan Jones: If we go back to before the 1800's, and someone were to read about the Hittites who are mentioned all over the Old Testament, no one before then could prove there were Hittites right? Dr. Fleming: Many people wondered if the Hittites were a biblical fantasy or something. In Central Turkey, their capital has been found and excavated. In fact, very important discoveries were made at a place called Ugarit on the western coast of Syria, called the Ugaritic Tablets, which were vassal treaties between the Hittites and their weaker neighbors, between a strong king and his vassals. The Hittite vassal treaties from the 1200 and 1100's BC have the same seven points to them as the outline of the book of Exodus does. This means the book of Exodus is a treaty between a people and their God. It is written in a way where everyone is going to see that this is a covenant and a legal document. 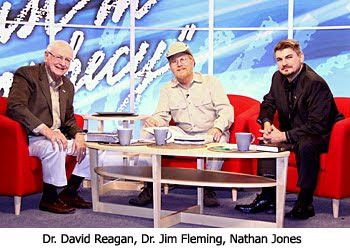 Nathan Jones: It sounds like again and again and again archaeology proves that the Bible is historically accurate. Dr. Fleming: It also shows you it reflects a period much older then some theories are suggesting. Dr. Reagan: I want to ask you about one of my favorites. Books written around 1800 AD argue that the Bible is full of myth, legend, and superstition because the proof positive was that Jesus spent 3 1/2 years of His life preaching in three towns that never existed. 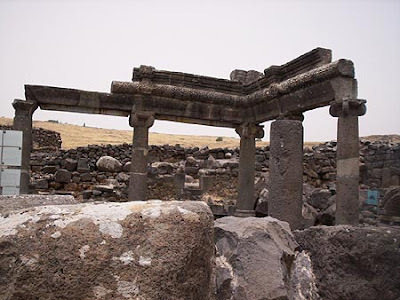 Those towns were Capernaum which was Jesus' headquarters, then Korazin (below) and Bethsaida. And yet, archaeology has since found all three cities, right? Dr. Fleming: Yes. That is great because the Bible has been put on the map. There have been so many excavations, or at least surface surveys, to know what period of pottery you find at a site. We now know where 25 of these 27 towns listed in the Gospels are. Nathan Jones: There are still two missing? Dr. Fleming: We are still not sure of two mentioned in John's Gospel, where John baptized from Bethany of Jordan as far as Aenon and Salim. We are not sure about Aenon and Salim yet. Dr. Reagan: Do we know where John baptized amd where Jesus was baptized? It would be in the southern part of the Jordan River, right? Dr. Fleming: John's Gospel says he baptized from Bethany of Jordan. 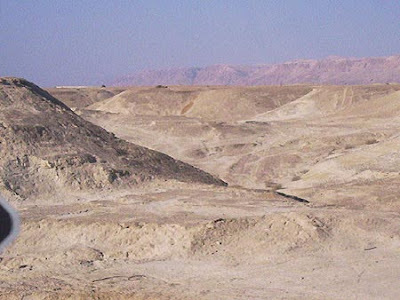 There are some who think that Bethany of Jordan may have been closer to the Sea of Galilee, but your main disadvantage there is that from Jesus' baptism He was led up into the wilderness of Judea. John's message was in the wilderness, declaring in the wilderness the coming of God's message. For that reason almost all scholars feel that Bethany of Jordan was just were the Jordan enters the Dead Sea near Qumran. Dr. Reagan: When you mentioned the wilderness it reminded of me of something humorous. We went over to Israel several years ago and we did a lot of television shooting in the Judean wilderness (below), which you know is just totally barren. It's just as barren as can be. We came back and showed this in the States at a premier and people came up afterwards and exclaimed, "I never had any idea that it looked like that! When I think of a wilderness I think of a thickly forested area." They had always thought that Jesus went out and spent his time in this thickly forested area instead of a barren wilderness. Nathan Jones: The only things there today are little sheep tracks that run all along the sides of the hills. Dr. Fleming: It did have predator animals, but they would be lions and leopards, and there are still a couple of leopards there and wolves. It was a dangerous area. That is why John's Gospel said in that wilderness that even wild beasts did not harm Jesus. But, yes, we should not think of a forested wilderness.